Kathmandu, July 29: The seventh edition of 'SAARC artists camp and exhibition of paintings 2017' has started in Gokarna here from today under the theme of Sacred Sites and the Beauty of Nature. Altogether 29 artists from SAARC six member countries are engrossed in their creative best at a resort in the middle of the Gokarna forest, away from the urban cacophony as part of the four-day event. The artists camp and exhibition is organized by the Ministry of Culture, Tourism and Civil Aviation, and the SAARC Cultural Centre. 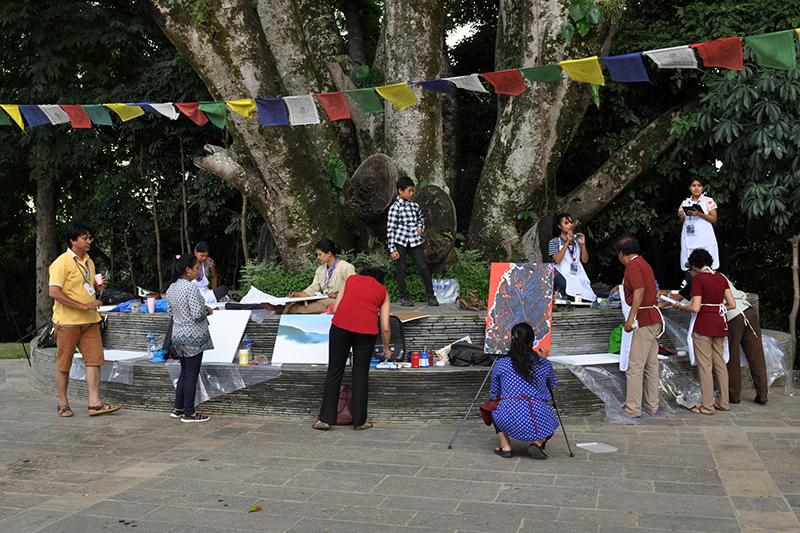 Ten artists from Nepal, five each from India, Sri Lanka and Bangladesh, three from Bhutan and one from Maldives are participating in the artists camp and art exhibition. Pakistan and Afghanistan have not participated this time. The participating artists would be taken on a tour of the cultural heritage sites, enlisted in the World Heritage Site list, in the Kathmandu valley on Sunday, Under-Secretary at the Ministry, Ram Prasad Sapkota said. The camp will conclude on Monday with an experience sharing interaction among the participants from the six countries. Inaugurating the artists camp, Minister for Culture, Tourism and Civil Aviation Jitendra Narayan Dev said the camp would foster an exchange of knowledge, skills, experiences and culture when artists from six countries work together. Ministry secretary Shankar Prasad Adhikari said the camp and art exhibition has been organized with the objective of familiarizing the artists with the culture and civilization of each other's country. Joint Secretary and chief of the Culture Division at the Ministry, Bharat Mani Subedi, SAARC Secretariat director M.H.M.N. Bandara, and Director of the SAARC Cultural Centre, Wasanthe Kotuwella expressed that the programme will contribute to the development of art in the South Asia region. The first such artists camp and exhibition was organized in 2011/12 in Colombo, Sri Lanka. The SAARC Cultural Centre is based in Colombo.